LEBANON, Ohio – June 16, 2009 – Returning to the famed venue that is the home track for both Doran Racing and co-driver Brad Jaeger, the team is looking to capitalize on a series of strong runs with the #77 Doran / McDonald’s Doran-Dallara earlier in the season and turn it into a podium finish at this weekend’s EMCO Gears Classic at the Mid-Ohio Sports Car Course. Earlier this season, the Doran team finished 5th at Virginia International Raceway, 7th at New Jersey Motorsports Park and missed a top-10 finish by just one place at Mazda Raceway Laguna Seca. In last year’s Mid-Ohio race, Doran Racing ran a 2-car effort during a race that was compromised by a torrential downpour. The #47 car qualified 7th on the grid and came home in 7th, continuing the team’s remarkable string of top-10 finishes during the 2008 season. The #77 car, co-driven by cincinnati, Ohio native Brad Jaeger and Memo Gidley had a potential top-5 finish derailed in the opening laps when Jaeger rounded Turn One to discover a torrential downpour and a track full of stalled and spinning race cars. He just clipped one of the stopped cars, which damaged the radiator and required a visit to the pits. After five laps, the car was repaired and the duo of Jaeger and Gidley soldiered on to record a 15th-place finish overall. Brad Jaeger is a native of Cincinnati, Ohio and recent graduate of Vanderbilt University where he was a member of their Formula SAE team. His racing resume includes karting, Sports 2000, Skip Barber, F2000, Star Mazda and the Indy Pro Series. 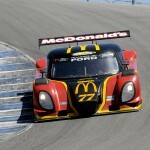 This is his second season of competition in the Grand-Am Daytona prototype class. Memo Gidley, the very talented and widely respected American driver who was born in La Paz, Mexico, now makes his home in Novato, California. He has made a name for himself as one of the most committed drivers in the paddock, driving and winning in everything from karts to Indy Cars and stock cars to prototypes and has recently expanded his winning ways to jet skis and test-driving vintage Grand Prix cars. During the 2008 season, the Doran Racing team scored eleven top-10 finishes, including eight in a row. In 2009 after falling victim to an engine electrical failure in the season-opening Rolex 24 at Daytona, the Doran Racing / McDonald’s team has shown its true colors as one of the Grand-Am series front-runners. In Round Two at Virginia International Raceway on April 26, the duo of Gidley and Jaeger qualified the car in 9th and finished 5th. In Round Three at New Jersey Motorsports Park, during a race-long downpour that made racing extremely difficult, the team qualified 10th and were headed for a podium finish until a late-race yellow flag failed to materialize despite several cars in the tire wall; the Doran / McDonald’s car fishtailed across the finish line in 7th. And the Doran Racing / McDonald’s team just missed scoring a top-10 finish in Round Four of the 2009 Grand-Am Rolex Sports Car Series, the Verizon Festival of Speed at Mazda Raceway Laguna Seca. Persevering through gearbox and handling issues, the #77 Doran / McDonald’s Doran-Dallara Ford co-driven by Memo Gidley and Brad Jaeger was among the fastest cars in practice; with Jaeger at the wheel, the team qualified 11th a persevered through gearbox and handling issues during the race to finish just one place outside the top-10. On track action at the EMCO Gears Classic begins on Friday, June 19 with several practice sessions. Qualifying to set the starting grid takes place from 5:10 pm to 5:25 pm Friday afternoon. The 2 3/4-hour EMCO Gears Classis for the Rolex Sports Car Series Presented by Corwn Royal Cask No. 16 is scheduled to take the green flag at 5:00 pm Saturday, Jun 20. The race will be broadcast live on SPEED TV. The next event on the 2009 Grand-Am Rolex Series schedule is the Brumos Porsche 250 at Daytona International Speedway on July 4. The race begins at 2.00 pm and will be televised live on SPEED TV.